Can anybody tell doctors what a hospital’s emergency room is for? Of course, not. Turns out Peter Drucker did. A legend in his lifetime, Drucker was once consulted by a hospital. They wanted him to help the Emergency Room (ER) of a hospital become more effective. Drucker started where he always does – mission. A mission statement answers the question – Why do we exist? 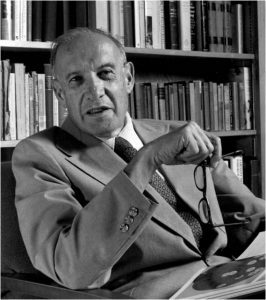 Drucker asked the stakeholders in ER, “What is your mission?” At this point, put yourself in the shoes of the stakeholder. When I do, I answer, “The mission of ER is to save the life of everybody who is brought in” That is why it exists. Isn’t that true? People are wheeled into the place because it is, as the name suggests, an emergency! A life is at stake. We must save the life of this person. For Drucker, my answer won’t cut it. To him, the mission had to be so clear that it spells out in operational terms what to do next to achieve it. And that is his real genius! If we go by my mission statement, that is saving the life of everybody who is brought in, that does not – hard as it may be to believe – clarify what to do to achieve it. My mission statement implies that the hospital has to front-load every capability and excellence it has in the ER itself. After all, a life is at stake, isn’t it? Read on and allow Drucker’s brilliance to get through to you. His words follow. A mission statement has to be operational, otherwise it’s just good intentions. A mission statement has to focus on what the institution really tries to do and then do it so that everybody in the organization can say, This is my contribution to the goal. Many years ago, I sat down with the administrators of a major hospital to think through the mission statement of the emergency room. It took us a long time to come up with the very simple, and (most people thought) too obvious statement that the emergency room was there to give assurance to the afflicted. To do that well, you have to know what really goes on. And, much to the surprise of the physicians and nurses, it turned out that in a good emergency room, the function is to tell eight out of ten people there is nothing wrong that a good night’s sleep won’t take care of. You’ve been shaken up. Or the baby has the flu. All right, it’s got convulsions, but there is nothing seriously wrong with the child. The doctors and nurses give assurance. We worked it out, but it sounded awfully obvious. Yet translating that mission statement into action meant that everybody who comes in is now seen by a qualified person in less than a minute. That is the mission; that is the goal. The rest is implementation. Some people are immediately rushed to intensive care, others get a lot of tests, and yet others are told: “Go back home, go to sleep, take an aspirin, and don’t worry. If these things persist, see a physician tomorrow.” But the first objective is to see everybody, almost immediately — because that is the only way to give assurance. So, the mission of the ER is to give assurance to the afflicted! How ordinary does it seem, isn’t it!! And yet, it gives such amazing clarity and coherence. It beautifully reconciles the role and mission of ER within the larger role and mission of the hospital. Front-loading everything at ER is bound to fail because you build life-saving excellence only if you get to deploy the best resources in a critical situation. That deployment happens in the Intensive Critical Care Unit (ICCU) and the Operating Theatre (OT). Everything about the ICCU or OT is by definition, a class apart from the rest of the hospital. ER is the first port of call for the afflicted and speed in initial diagnosis is crucial. That necessitates job-aids for all medical emergencies like strokes and heart attacks. Using those job aids is the best assurance to the afflicted because those at real risk are rushed to intensive care. To me, Drucker’s brilliance in clarifying mission is a great reminder of never taking the mission of any organization or any organizational unit for granted. Why does HR exist? Why does Accounts exist? Why does L&D exist? Answering these questions against the backdrop of your specific reality will yield better answers if you strive to imbibe Drucker’s brilliance. Let the last words be his! Almost every hospital I know says, “Our mission is health care.” And that’s the wrong definition. The hospital does not take care of health; the hospital takes care of illness. You and I take care of health by not smoking, not drinking too much, going to bed early, watching our weight, and so on. The hospital comes in when health care breaks down. An even more serious failing of this mission is that nobody can tell you what action or behavior follows from saying: “Our mission is health care.